German publisher Heise Verlag is an international curiosity. It publishes a small number of highly influential computer-related magazines that give a voice to a tech ethos that is at the same time extremely competent in the subject matter (I’ve been a steady subscriber to c’t magazin for over 15 years now, and I am still baffled sometimes just how good it is) and very much aware of the social and political implications of computing (their online magazine Telepolis testifies to that). Data protection and privacy are long-standing concerns of the heise editors and true to a spirit of society-oriented design, they have introduced a concept as well as a technical implementation of a two-step “like” button. Such buttons, by Facebook or other companies, have of course become a major vector of user-tracking on the Web. By using an iframe, every button loads some code from Facebook’s server and sends the referring url (e.g. http://nytimes.com/articlename/blabla) as an information. The iframe being hosted on the facebook.com domain, cross-site privacy protections can be circumvented, the url information connected to an identifier cookie and, consequently, to a user account. Plugins like the Priv3 project block these mechanisms but a) users have to have a heightened level of awareness to even consider installing something like this and b) the plugin interferes with convenient functions like Google search preferences. 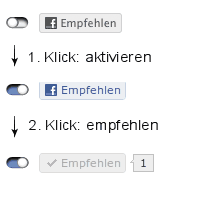 Heise’s suggestion, which they already implemented on their own sites, is simple: websites can download a small bit of code that implements a two-step procedure: the “like” button is greyed out after the page first loads and there is no tracking happening. A first click on the button loads the “real” Facebook code, and the second click provides the usual functionality. The solution is very simple to implement and really a very minor inconvenience. Independently from the debate whether “like” buttons and such add any real value to the Web, this example shows that “social” features like these can be designed in a way that does not necessarily lead to pervasive user tracking. The echo to this initiative has been very strong (check the Slashdot discussion here), especially in Germany, where privacy (or rather Datenschutz, a concept less centered on the individual but rather on the role of data in society) is an intensely debated issue, due to obvious historical reasons. Facebook apparently threatened to blacklist heise.de at a point, but has since then backpedaled. After all, c’t magazin prints around 600.000 issues of every number and is extremely influential in the German (and Dutch!) computer landscape. I am very curious to see how this story unfolds, because let’s be clear: Facebook’s earning potential is closely tied to its capacity to capture, enrich, and analyze user data. This initiative – and the Heise ethos in general – underscores that a “respectable” and sober engineering culture does not exclude an explicit normative stance on social and political issues. And is shows that this stance can be translated into technical models, implemented, and shared, both as an idea and as code. Post filed under algorithms, critique, economy, privacy, social networks, society oriented design, surveillance, web 2.0. Found your post over google, while searching for an implementation of the concept specially for WordPress. Unfortunatly your Blog doesn’t contain a link to code provided by Heise nor does it state the name of the project. With RequestPolicy, the third-party sites are blocked by default and you can activate them on a case by case basis if you need them to know you are there.